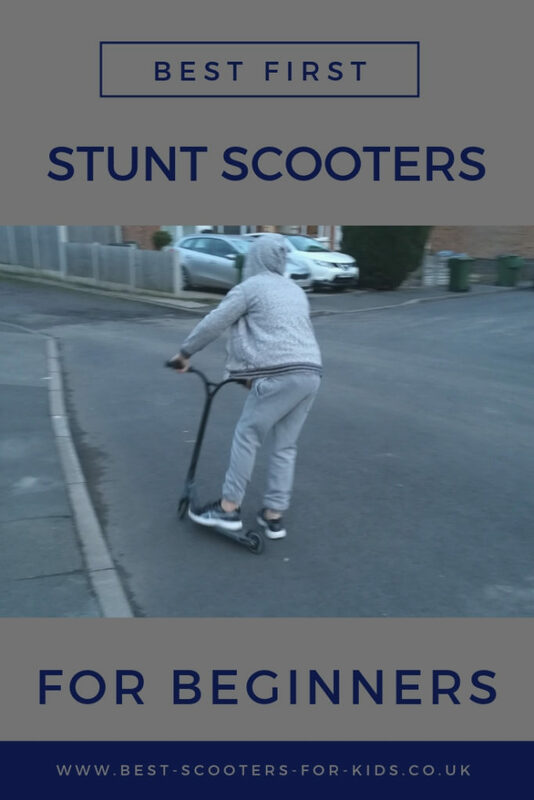 If you're looking for a first stunt scooter for a child, there are many entry level scooters available at different prices and with varying specifications. It can be quite confusing if you're unsure what the specs actually mean and what you are getting for your money. Read on to see our selection of 10 best entry level stunt scooters in 2018 where we dig down and found out what the specifications actually mean. Bar - a one piece bar (not a foldable bar) to withstand the impact of tricks. The handlebars should ideally reach no higher than waist height or sit just about hip height/ below waist height. Wheels -avoid plastic core wheels. Metal core wheels are designed withstand jumps. Most beginner scooters will have wheels either 100mm or 110mm. 120 to 125mm are normally seen on more expensive pro scooters. Weight - the lighter the better for doing stunts. Smaller, younger children in particular need lighter scooters to control. Threadless vs Threaded Forks - Threadless forks are stronger and therefore a better choice than threaded forks. Slamm are a leading brand of stunt scooters which are designed in the UK. They aim to offer high end specs at affordable prices and make many entry level scooters check some out below. The Slamm Classic is a full sized beginner scooter. Slamm recommends this scooter from aged 6 plus. ​Bar - the bar is extra strong with reinforced steel and measures 20.5 inches by 22.5 inches. Ideally you want the bar to come up to beween hip height and waist height. The height between the top of the deck is 76cm. This measurement is useful as it can help determine how high the handlebars with come up against the rider. Ideally you want them to reach between hip and waist height. Wheels - the wheels are a standard 100mm in size at 88A. They feature an alloy core to withstand the impact from jumps and tricks. Deck - measures 4.5 x 18.8 deck. The 4.5 inch deck is slightly wider than some other entry scooters. A wider deck gives a bit of extra stability. Other features - for the price this scooter boasts lots of top end features which include a flex brake, threadless headset, IHC compession, pro swirl hand grips with impact resistand bar ends. Verdict - this scooter has everything required for a 1st stunt scooter for the younger rider and some higher end specs thrown in too. For ages 8 plus, check out the slamm urban VII below too. The Slamm Urban VII is aimed at kids from age 8 plus. It's similar in stats to the Classic but it's offers biggers wheels and reinforced steel dipped Y-Bars . Bar - like the Slamm classic the bar measures 20.5” x 22.5 but it's styled slightly differently with a dipped y bar. The bar is made of reinforced steel for extra strength and durability. Wheels - the 110mm 88A PU cast alloy core wheels. 110mm wheels are generally considered better on a stunt scooter because they are faster, smoother and last a bit longer. They also add slightly more height to a scooter. Deck - the box deck measures 4.5" by 18.8". Other features - has a composite steel flex brake, IHC compression, threadless headset, pro grips with bar resistant ends.Verdict - an excellent choice of first stunt scooter for the 8 to 12 age group. The 110mm wheels give it the edge for slightly older children over the Slamm classic above. Some will also prefer the look of the y shaped bars. The Madd Gear Pro VX8 scooter is new for 2018. It is a great stunt first scooter with 110mm wheels and a 4.5 inch deck for kids aged 8 plus. If kids are serious about scootering, this is a good option to upgrade when needed. Bars - the bars are taller than on the Slamm scooters at 23 inches high. The width is 21 inches. It makes it a good choice for older kids and teens. Wheels - it features 110mm wheels 88a corrupt core wheels with MGP proprietary polyurethane, These are strong and durable. Deck - measures 4.5" by 19.5", which is wider than the previous Madd gear model - (VX7). The deck made with integrated 6061 T4 & T6 heat treated alloy and fluted with 3° concave... What does this mean? From the Madd Gear website - the 6061 aluminium are first run through a process called solution heat treating and then through an ageing process which generates a material that is both structurally strong but also very durable. Verdict - This scooter has been designed to be as light as possible while being extrememly strong and with 110mm wheels. It's a fantastic choice for the beginner to intermediate ride who has aspirations to take their scootering to the next level. Another fantastic entry level scooter is the Grit Extremist 2018. Another fab option for the 6 plus age group. Bar - 20" height x 21" width, this is the smallest bar height featured so far. Another useful measurement is the height from the top of the deck to the top of the bars which is 29" / 73.6cm which is also on the smaller side. Wheels - 100mm wheels - again these are fine for the most beginner riders (particularly the younger rider). They feature an alloy core and are 88a PU wheels. Deck - strong but lightweight (made with 6061 heat treated alloy) measuring 4" by 19"
Other features threadless fork and flex brake. This is another great scooter, light enough for the youngest riders to handle but also strong enough for older intermediate riders too. ​What makes this scooter unique is that it's so lightweight at just 3kg for a stunt scooter, making it a great choice for the younger rider around age 8 plus in particular. Bars - : 22" high x 22" wide. Bars are smaller in height than standard but perfect height for some growing room for younger kids. Deck : 4.5" wide x 19.6" in length. Weight - super lightweight for this type of stunt scooter at 3.04kg. A great scooter for the up and coming rider to give them some extra control with the wider wheels and lightweight frame. Lucky are another leading brand of pro scooters and this is their most affordable option. It's a good choice if the child in question is serious about scooting as parts can be changed and upgraded with all Lucky's pro scooter parts as stunt scooter skills develop. Bars - the kinked bars are 23 tall and 21 wide. The vice grips on the end of the bars are super comfortable and durable. Deck It's 19" long by 4.25 inches wide and features a perfect sheet of lucky grip tape on top. It's fully upgradeable and customisable with all of Lucky's pro scooter parts, giving the user lots of options to customise the scooter.